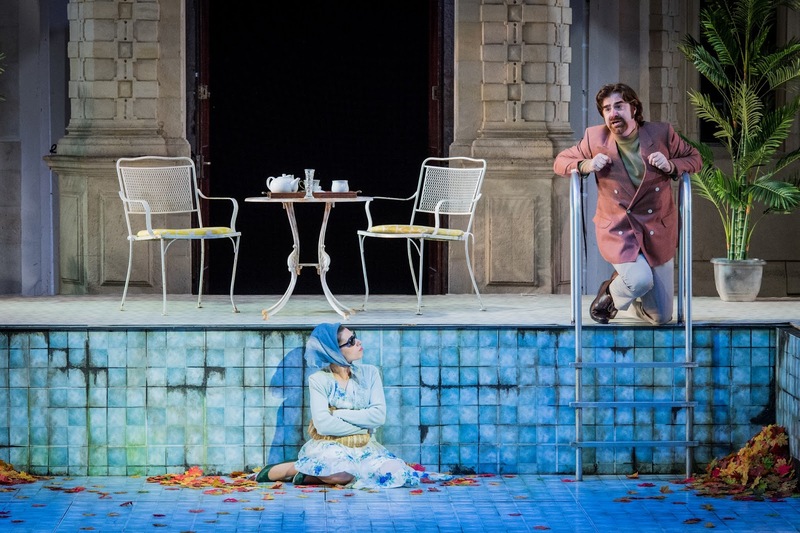 Opera Holland Park's 2017 season opened on 1 June 2017 with Martin Lloyd-Evans' new production of Puccini's La Rondine, designed by takis, with lighting by Mark Howland and choreography by Steve Elias. Elizabeth Llewellyn was Magda (you can read my 2016 interview with Elizabeth Llewellyn on this blog) with Matteo Lippi as Ruggero, Tereza Gevorgyan as Lisette, Stephen Aviss as Prunier and David Stephenson as Rambaldo, Matthew Kofi Waldren conducted the City of London Sinfonia. The two operas with which Puccini followed Madama Butterfly (1904), La fanciulla del West (1910) and La rondine (1917) are the two operas where Puccini used to be seen as not being completely on form, before he returned with his final operas Il Trittico and Turandot. 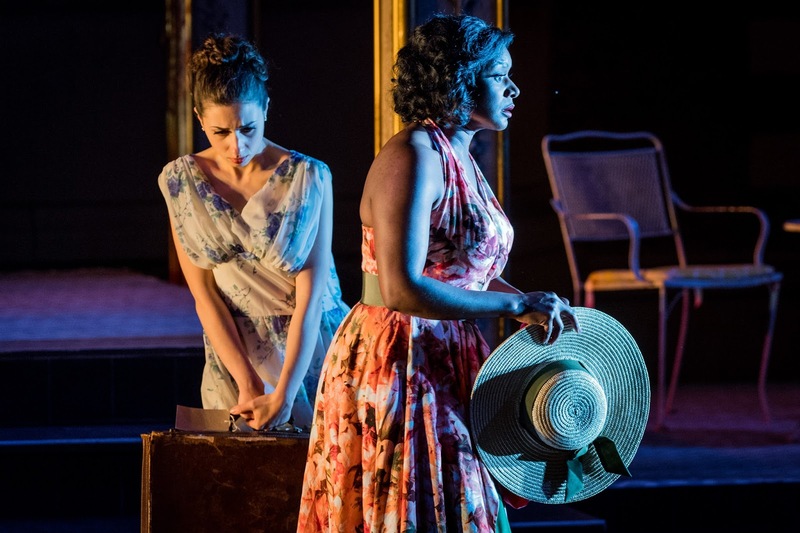 Though La fanciulla del West has been somewhat rehabilitated, La rondine still somewhat languishes and can be seen as combining pleasant melodies with plot which is a bad re-hash of La Traviata and Die Fledermaus. But the period after Madama Butterfly saw Puccini trying to extended and develop his art both thematically and harmonically, for instance La fanciulla del West uses an advanced harmonic language and a daring lack of free-standing aria, and the triptych form of Il trittico was highly innovative. So La rondine can be seen in this light, as an experiment in the other direction, trying something lighter. Originally intended as an operetta, Puccini dropped the idea of spoken dialogue (though other Italian contemporaries would try operetta), but La rondine remains lighter in style with greater use of popular dance rhythms. And the plot can be seen as re-visiting La boheme; it helps to make sense of the dramaturgy if you think of Magda and Prunier as Musetta and Rodolfo (from La boheme) some years later, and Magda's fond memories of Bullier's in Act One a reminiscence of Cafe Momus. We heard Puccini's original version of the opera (the one usually done), though Ruggero's Act One solo was included from Puccini's final revision. Martin Lloyd-Evans' production set the piece loosely in the 1950s which meant that Chez Bullier became the sort of smoky French cafe/bar familiar from films, whilst the hotel on the Riviera in Act Three had certainly seen better days. Costumes were stylish, and I was impressed that the outline and high-waistlines of the men's suits were correctly in period. I can understand that Magda's Act One costume was intended to make her stand out, but its rather acid yellow colour was anything but flattering. Act One is very much an ensemble piece with Magda (Elizabeth Llewellyn) being surrounded by Prunier (Stephen Aviss), Rambaldo (David Stephenson) and the guests (Henry Grant Kerswell, Timothy Langston, Alistair Sutherland, Pia Harris, Alice Privett, Sophie Dicks), and much of Puccini's writing is in the same ensemble conversation style which he used in the opening of La fanciulla del West; it is a style which can be tricky to bring off on the large open stage at Opera Holland Park and the act took some time to settle. What really counted was the dramatic interaction between the performers, so that though Puccini and his librettists give us very little background, Lloyd-Evans and his cast established a real atmosphere between Magda and Rambaldo. The transition to Act Two was done almost instantaneously with the cast dramatically ripping off the decor for Act One. Chez Bullier really showcased the excellent Opera Holland Park Chorus (chorus master Nicholas Jenkins) and this provided the lively backdrop for the developing relationship between Llewellyn's Magda and Matteo Lippi's Ruggero, counterpointed by the lively bickering of Aviss's Prunier and Gevorgyan's Lisette. The use of the original version of the opera means that the third act ultimately concentrates on Magda and Ruggero (no trio of vendeuses, no scene for Rambaldo), and Lloyd-Evans' production made the most of this. Elizabeth Llewellyn's Magda took some time to develop. In Act One she was very much part of the ensemble with only the verse of 'Chi il bel sogno di Doretta' to show off. This was done with great character making it part of the drama rather than milking it as a big solo. 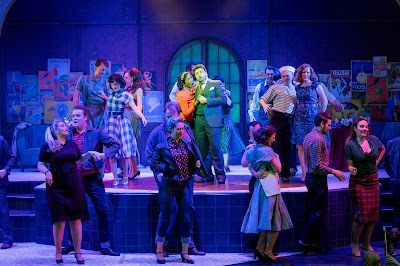 In Act Two it is the relationship with Ruggero (Matteo Lippi) which counted and the two made a real connection, soaring in the love duet. It was this connection which made Act Three blossom, Llewellyn and Lippi soared again in the final duet, and if the ending is not quite as heart-rending as some Puccini's ones, Llewellyn showed how to make it count with sheer beauty of line and a glorious sheen to the voice. This certainly showed how having a real spinto soprano in the role can count. Matteo Lippi (who sang Pinkerton with Glyndebourne in 2016) made a delightfully sympathetic Ruggero, emphasising the character's small-town naivety, this was really brought over in his delightful Act One solo. Throughout Lippi sang with a lovely rich, bronzed sound which also helped imbue Ruggero with sympathy. He and Llewellyn made a wonderfully balanced pairing, with Lippi including just the right combination of bravura solo and supportive partnering, matching Llewellyn in beauty of tone. Tereza Gevorgyan made a delightful, hyperactive Lisette, singing Puccini's coloratura-style line with both style and accuracy, plus a sense of wit. Stephen Aviss made a robust, characterful Prunier providing a necessary contrast in tenorial style from Lippi, and providing his own piano accompaniment in 'Chi il bel sogno di Doretta'. But it was the way Aviss and Gevorgyan developed a really sparky relationship, carrying us through all three acts, which formed a nice complement to the two leading characters. David Stephenson made a nicely sympathetic Rambaldo, whilst Henry Grant Kerswell, Timothy Langston, Alistair Sutherland, Pia Harris, Alice Privett, and Sophie Dicks provided strong and characterful support, and Alys Roberts gave us the delightful solo at the end of Act Two. 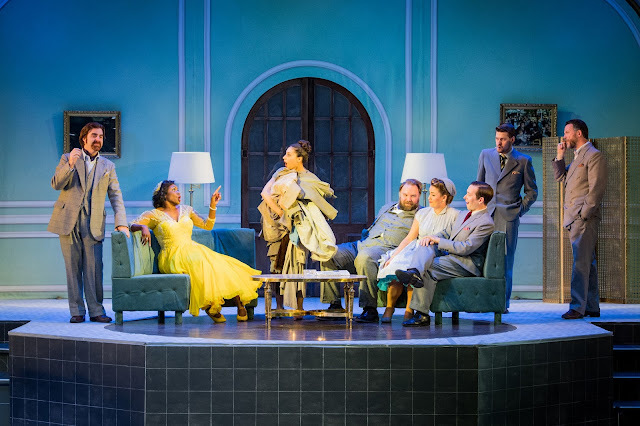 Matthew Kofi Waldren kept the ensemble scenes in the first two acts moving with vivid impetus, encouraging the orchestra to provide characterful, full-blooded drama which complemented the stage though occasionally I would have liked vibrancy to give way to something more relaxed. But in the duets, Waldren showed that he could balance things, allowing the singers to shape Puccini's melodies. This wasn't the most luxuriant account of the score, but the playing of the City of London Sinfonia brought out the vibrant colours and details of Puccini's writing. 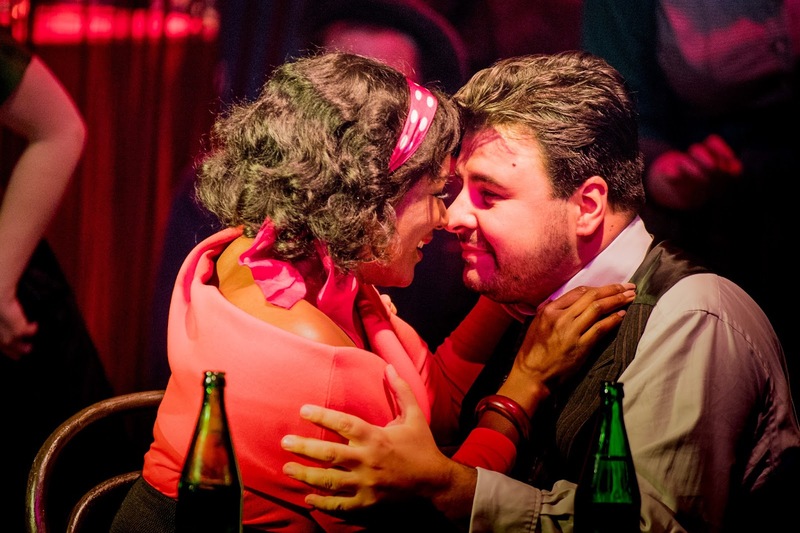 There are seven more performances of La Rondine and I suspect that the performance, particularly the opening act, will bed down nicely and develop. But it is in the superb partnership of Elizabeth Llewellyn and Matteo Lippi that the strength of this production lies.